LDR, LED, capacitor, sound module, buzzer. music module, battery, IR receiver, wireless module, diode etc. Now you can measure many things with this super fun multimeter! You can measure sound, air, electricity, resistance etc. Be the electronics wizard of your family, and surprise others by your super measuring activities! Jayan has learned something new you should know. Do you know that different color can harvest different amount of electricity? ? This is fun and beautiful! To do this experiment, you need LDR (Light Dependent Resistor), multimeter and battery casing. There are 50 activities in this box like this. 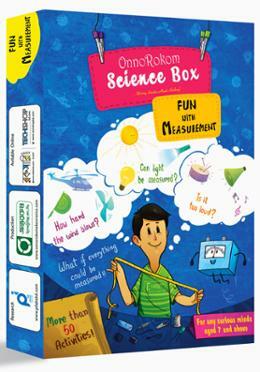 So, are you ready to be a little scientist like Jayan?